This Sunday evening/Monday morning will bring the peak the Geminids, one of the year’s better meteor showers. It’s usually a toss up as to which is better, the Perseids of August or the Geminids, though lately the Geminids have been routinely out-producing the Perseids. If the sky is clear where you live this Sunday/Monday night will provide one of the few nights of the year when it’s almost guaranteed that you will be able to observe a meteor after about 10-20 minutes of observing. From a dark, moon-less sky, the Geminids have been known to consistently produce rates of over 100 meteors per hour at their peak. Unlike most showers that can only be observed in the early hours of the morning, the Geminids can be seen in good numbers as early as 10 pm and are great anytime after midnight. The Geminids will appear to radiate from the constellation of Gemini near the bright star Castor. According to analysis of meteor video data by Sirko Molau, the Geminids are active for almost an entire month between the dates of November 23 and December 21. Though high rates are only possible within a few days of the peak. This year the peak is predicted for the nights of December 13/14. The International Meteor Organization (IMO) has a “live” graph showing the rate of the Geminids as reported by visual observers around the world. Most meteor showers are produced by comets with orbits that extend out to the orbit of Jupiter or beyond. The Geminids are different. They are on a very short uncomet-like orbit that extends from a very close 0.14 AU from the Sun to a not so far 2.40 AU. 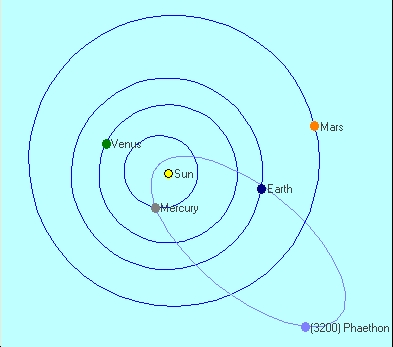 Orbit diagram of the Geminids and their parent Phaethon. Chart is valid for Dec 13, 2009. Created with the freeware program C2A. In 1983, the parent body of the Geminids was discovered and surprisingly it looked like an asteroid. Since its discovery, the Geminid parent (3200) Phaethon has not (or has it, more below?) shown any cometary activity. So what is it? 1) Phaethon could be a comet whose original orbit evolved into its current one after many millennia of close approaches with the inner planets. Some models of the formation of the Geminids require the shower particles to be released over many centuries to millennia. This is consistent with the behavior of a comet. 2) Phaethon may be a Main-Belt comet. Main-Belt comets are objects that originate in the outer Asteroid, or Main, Belt. Since they contain a sizable fraction of volatile material (water, carbon monoxide, etc. ), they can occasionally exhibit cometary activity. Four of these objects have been observed to display cometary activity in the Main Belt. Since they start on asteroid orbits, it is not too difficult for one of them to find itself on an orbit similar to Phaethon. 3) Phaethon is an asteroid that broke up in the past. There is evidence to suggest that Phaethon is just the largest piece of a past break-up. In fact, two additional asteroids that may once have been a part of Phaethon have been found, (155140) 2005 UD and 1999 YC. According to Peter Jennisken’s book “Meteor Showers and Their Parent Comets”, the Geminids can be explained by the break-up of Phaethon just after perihelion many orbits ago. Since Phaethon gets to within 0.14 AU (14% of the Earth-Sun distance), perhaps it split under the intense solar heat. BTW, this scenario does not rule out Phaethon as a ice-rich Main-Belt comet. The recent discovery of additional asteroids related to Phaethon points to scenario 3 as the most likely origin of the Geminids. If true, the Geminids were not the result of long-term cometary activity like most meteor showers but were created in a single event when Phaethon split or shed a smaller piece. The Daytime Sextentids and perhaps the very minor Canis Minorids were created by even older break-up events. Though Phaethon has behaved like an asteroid since discovery there was an event of something weird happening this summer. For a few days this July, the asteroid was visible in near-Sun images taken with the STEREO spacecraft. At the time Phaethon was near perihelion and appeared to be elongated as if it had a short tail. The asteroid also appeared to brighten at the time. Though the details are still sketchy and we await a more rigorous analysis, it is possible Phaethon released some particles for a few days. At the same time the asteroid was in the midst of a relatively dense stream of particles released emanating from the Sun (remember at the time Phaethon was only 0.14 AU from the Sun). Perhaps these particles knocked some fine regolith (science term for asteroid soil) off the surface and this sort of event is a common occurrence for objects with very small perihelia distances. any other sightings reported from Northern New England and/or Canada?